The 11th Annual St. Joan of Arc Gala and Auction takes place NEXT Saturday, March 4th at Assumption Cultural Center. 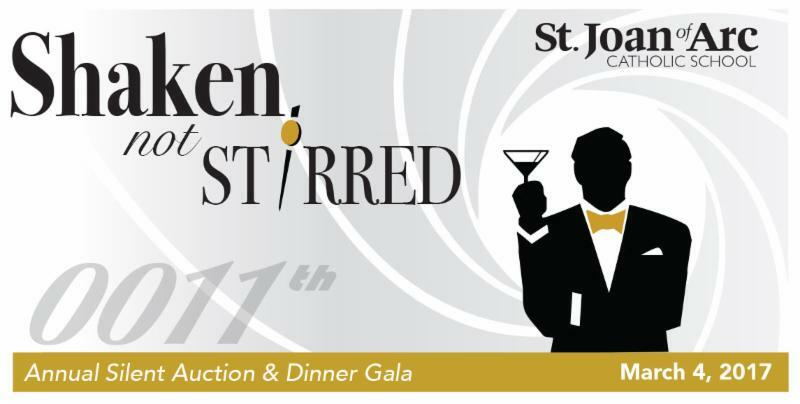 The Gala, "Shaken, Not Stirred" with a James Bond theme, features complimentary valet parking, open bar, a gourmet dinner, live and silent auctions, raffles as well as entertainment throughout the night. We have some very exciting auction items that include a week&apos;s stay at Walt Disney World, a week in a Big Blue Lake cottage, a Red Wings experience with host Tom Mazawey, a $1,000 Apple gift card, a men&apos;s Shinola watch, David Yurman cross and bracelet from Ahee Jewelers, an overnight stay at Birmingham&apos;s The Townsend, a drone, Tigers&apos; Champion&apos;s Club Opening Day tickets, 3-days of Festival Fun, Cedar Point package and so much more! There are still some Gala tickets available for $95 per person, or $200 for an exclusive Champagne Preview. The ticket price includes your entree selection of Beef, Chicken or Vegetarian. Ticket costs help cover the costs of producing the event, which is 100 percent volunteer organized. You can make your reservations now via our new online site, powered by Gesture. This program will allow you to bid on auction items that night via your smartphone or tablet. You will receive texts to update you on your bids and donations throughout the evening - get ready for some fun and an easier-than-ever checkout process! Click on the link SJA Gala for ticket reservations, and to be automatically registered for the new online bidding at this year&apos;s event. Online reservations will be turned off Tues., 2/28, or sooner if sold-out! The Gala also needs event volunteers! If you want to help out that night, we need people to walk the auction floor and help distribute the items afterward. Please click on this link to let us know if you can help for all or part of the night. There will be a meeting for all volunteers on Wed., 3/1 at 7pm in the Faculty Lounge in School. Finally, this is the last weekend to purchase raffle tickets for $20 or $100 for six. The grand prize is $5,000 cash or a travel voucher for a trip of your dreams! Tickets are available at the school office or Parish Center. School families, please return your unsold tickets to school. Thank you as always for helping support SJA and its students! For more information, contact the school office at (586) 775-8370.